The Miss Beauty of the Netherlands is a pageant organized by Milou Verhoeks and a big team. 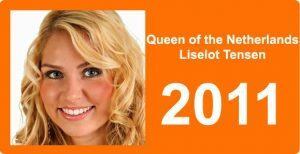 It started as Queen of the Netherlands in 2009 after Milou represented the Netherlands at the Queen of the World 2008. In 2010 it was named Queen of the Benelux, as Milou was asked to send 4 girls to Queen of the World. Since 2015 it is Miss Beauty of the Netherlands. The winners of the Queen pageants would represent the Netherlands at the Queen of the World pageant. But this pageant is not being held anymore since 2012. This page is dedicated to the pageants that Milou Verhoeks organized. There are more girls who represented the Netherlands at the Queen of the World in the past.